A fun "smashing" game with Halloween theme. 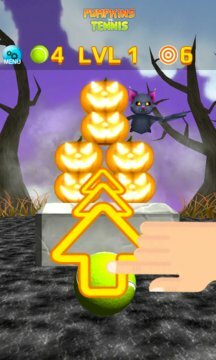 Your task in the game is to knockdown all the pumpkins in various formations with a limited number of tennis balls. Just swipe to launch the ball and hit the pumpkins. There are 60 levels to conquer with various pumpkins, including exploding pumpkins, and angry flying pumpkin monsters in formations. 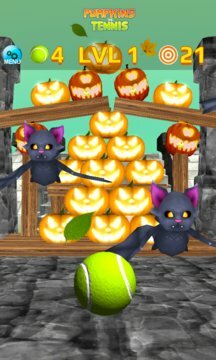 Since you have a limited number of tennis ball on each levels to destroy all the pumpkins, and many levels require some thinking, try to hit all the pumpkins with the least amount of throws. Earn star ratings if you hit all the pumpkins and completed the bonus goals. Discover special effects, such as extra balls and destructive pumpkins that blast other pumpkins around it, fog effect, and more. The game is powered by a fun physic engine which makes things behave in semi-realistic ways. Conquer 3 different environments which basically means lots of pumpkin smashing mayhem. So if you’re looking for something fun this Halloween season, try the game that pits pumpkins against tennis balls.